Schneids: I understand that a lot of people reading this may not know who you are, so tell me about some of your crowning competitive victories be it poker or otherwise? Daniel: The earliest title I remember winning was the 2002 Blitz Chess Championship at Park Senior High School. My biggest accomplishment in poker came in one of the smallest buy-in tournaments available online, and the only tournament I have won with over 1,000 entries. It was the $2.20 NLH Quintuple Shootout 4-max Turbo on Stars in 2009. It was the first time I cashed that particular event, but I got addicted after the victory and started playing it constantly after, I racked up some cashes, but never another win. Schneids: To this day I’ve never won a tournament with over 1000 entrants, that’s pretty rad. But for real now, tell us a little bit about your poker playing history—how long, how often, what got you into poker, etc? Daniel: I started playing 5 Card Draw with my sister when we were in elementary school with loose change we found around the house. Poker became a bigger part of my life post-Moneymaker. Some friends started playing and I quickly got addicted. I was 17 at the time and starting playing in 3 games a week very shortly. I had one game at my house in Cottage Grove, one game at a friend’s house in Saint Paul Park, and a semi-public game in Saint Paul that would play between 25-40 people a week. They were all NLH tournaments, and I usually would win the game at my house which would give me enough money to dump into the other two games where I rarely made any money. As certain friends realized they weren’t going to become millionaires automatically and stopped playing as regularly I turned to the web. I loved online poker on Full Tilt and Pokerstars as they let me play non-hold’em events and mixed games which very rarely could I find a live game for. I developed a love for Razz, Deuce to Seven, Badugi, and PLO8 online and can’t wait for the day that Minnesota gets online poker back so I can play those games again. Schneids: Your large home game background is so cool and definitely a thing I’m trying to make PIFT feel a bit more like, that’s awesome your playing days got shaped that way even with those ups and downs. Do you have any favorite local or national poker superheroes or anyone who you credit for helping the development of your poker game or interest in poker? Schneids: Celebrity Poker Showdown. Hah! I remember that. It had surprisingly good entertainment value. I’m glad to hear you like Rec Poker, I’m a big fan of it too and have been on it twice now! So…. Changing gears a bit–you get to fill a table with whoever you want, living or dead, who’s invited and what is being played? Daniel: We are definitely playing a cash game with a large rotation of mixed games including games I have only heard about like Razzdugi. I would want to have a combination of people from home games that I haven’t played with in a long time like Adam Sime, Cameron Rackner, and Andrew Lee. I would round out the table with professionals who seem like they know how to have a good time at the table playing mixed games: Doyle Brunson, David Bach, Phil Laak, and Lex Veldhuis. Schneids: I love it that your game would include games you’ve never even played before. I’m in Vegas right now and yesterday I was sweating a buddy in a mix game for a few hands waiting for him to finish his orbit so we could get dinner, and they were playing Drawmaha. I’ve never played it before but it looks awesome. Half the pot goes to the best 5 card draw hand, half the pot goes to the best omaha hand using a 5 card board. You get to do a draw after the flop. Looked real fun. That said, what is it you like about PIFT and has helped turn you into one of our social media’s biggest advocates? 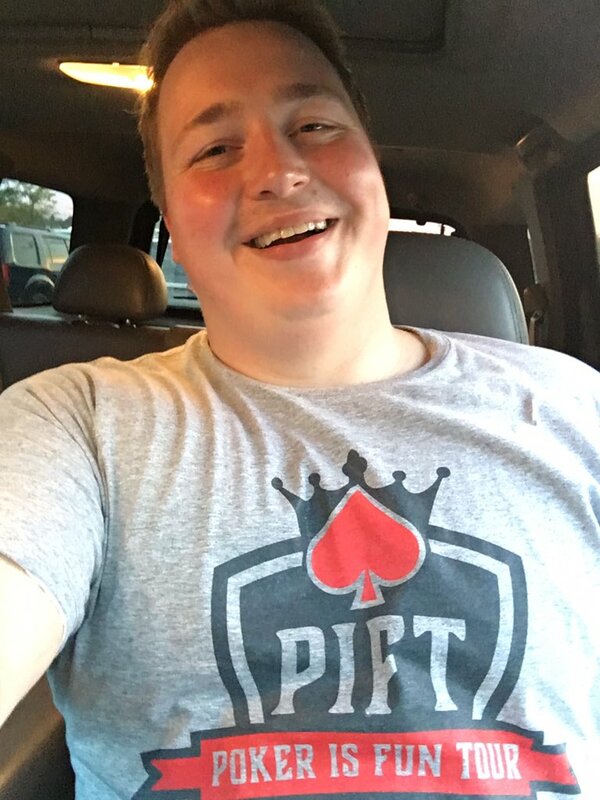 Daniel: I like PIFT for 2 reasons. 1) They give back to charity, and any time to do something I enjoy and have it benefit others is a win-win. 2) The commitment to reinvigorating the energy at the poker table. Since I more frequently donate money at the table than take it home, being able to have some fun at the table is pretty important to me. Schneids: You sound really well-grounded, so what activities do you enjoy away from the felt? Daniel: I like to play board games, cribbage, backgammon, and golf. Besides those games, I like to play with my puppy Fred and eat my wife Sarah’s delicious cooking. I love going to the Buffalo Farmer’s Market on Saturday mornings and picking up a pastry and a coffee to kick off the weekend. Schneids: What is your day job? Daniel: I am a Human Resources Business Partner for a company in the Western Suburbs. Prior to that I was a recruiter at a temp agency where I interviewed a member of the Minnesota North Stars and before that I worked in restaurants for about 10 years. Cool side note: I once served lunch to the Harlem Globetrotters when managing a restaurant in Willmar, MN. Schneids: One last Q… I understand that you won “Best Radio Show” at KUMM in your senior year at the University of Minnesota – Morris. Can you tell us a little more about what that show was about and what your role was? Daniel: I was the co-host of a radio show called “We Brake for Hotties,” with Sara Bremer. It was a once a week program where we would interview a local single and announce to campus that they were ready to mingle. Times before Tinder called for desperate measures. Since it was staffed by college students we did almost everything for the show. We picked all of the music for our shows, controlled the sound board, interviewed guests, read advertisements, and kept records of everything played on air. It was an absolute blast and our station manager Mac Wilson went on to become a DJ at The Current. Schneids: Awesome, thanks so much for taking the time to chat with me Daniel, and we’ll see you at the PIFT tables in 10 days!